July is national dry eye month.  Here at Poplar Spectacles Optometry we believe that listening to even the smallest of irritation occurring in your eyes is important. If you feel that you may have dry eyes disease read on and schedule your appointment today to start treatment of your symptoms. A projected 25 million patients in America suffer from Dry Eyes. By 2022 its estimated that there will be a 16.4% increase to 29.1 million people. Don't let your Dry Eye disease go untreated any longer. Does your vision fluctuate, especially in a dry environment? 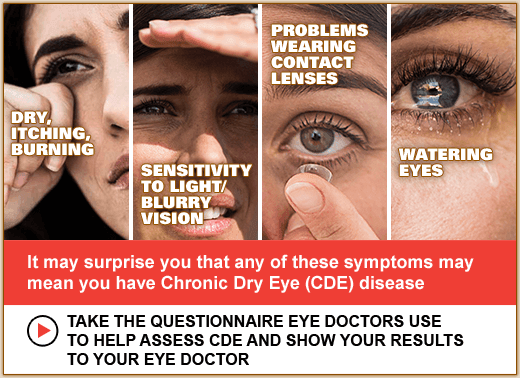 Explore all of the Dry Eye resources on the Allergran website at mydryeyes.com and take their questionnaire here if you suspect you may be suffering from CDE. Do you have concerns or questions about your child's vision? Ask us! Dr. Wu performs visual exams on children as young as 3 years old. Think your child might be a little squeamish in the exam chair? That's no problem, we are more than happy to give you some practice material to use at home prior to your child's first exam so the experience is as easy as possible for both parents and child. Kids don't know what they can't see. Make sure they are seeing clearly with annual eye exams. In spirits of this holiday season during the month of December for every purchase of glasses made here at Poplar Spectacles Optometry we will be donating $5 to one of the non-profits from the local community. After you've made your selection you'll get to choose which organization you'd like us to donate on behalf of your purchase. Below is the list of the five organizations that have been selected for 2015. Co-founded by Elaine and Tony La Russa in 1991 ARF now holds its headquarters in Walnut Creek, CA. Its mission is to save dogs and cats who have run out of time at public shelters and brings people and animals together to enrich each others lives. ARF strives to create a world where every loving dog and cat has a home, where every lonely person has a companion animal, and where children learn to care. Here is a great infograph from the CDC (Centers of Disease Control & Prevention) about the importance of taking proper care of your contacts. A study by MMWR showed that more than 99% of contact wearers may be may be engaging in at least one behavior that could lead to eye infections. Your habits and supplies (lenses, case, solution) matter when it comes to keeping your eyes healthy. Do you have some contact routines that need to change to ensure your contact lenses are the most comfortable they can be? Read the full article about Healthy Contact Lens Wear to see how you're doing. If you have concerns or discomfort with your current contact lenses schedule an appointment to speak with your doctor as soon as possible. What are your eye doctors looking for during comprehensive eye examination? You know the importance of ocular health, but what is your eye doctor looking for during your examination? 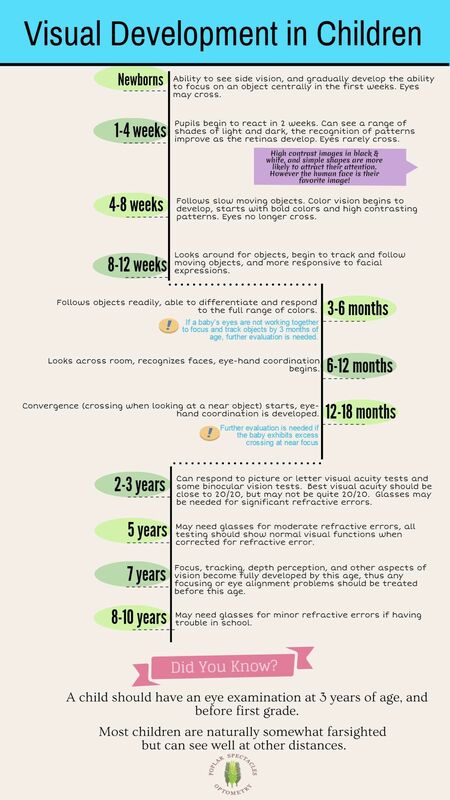 Let’s walk through the series of tests done during a routine eye exam. Your eye doctor will begin by asking about your general health. This includes any medical history, medications you are taking, previous eye trauma, or any close relatives with a history of eye problems. Many health conditions and medications can affect your vision and visual system. For example, diabetes or hypertension can cause problems in your eyes or vision. 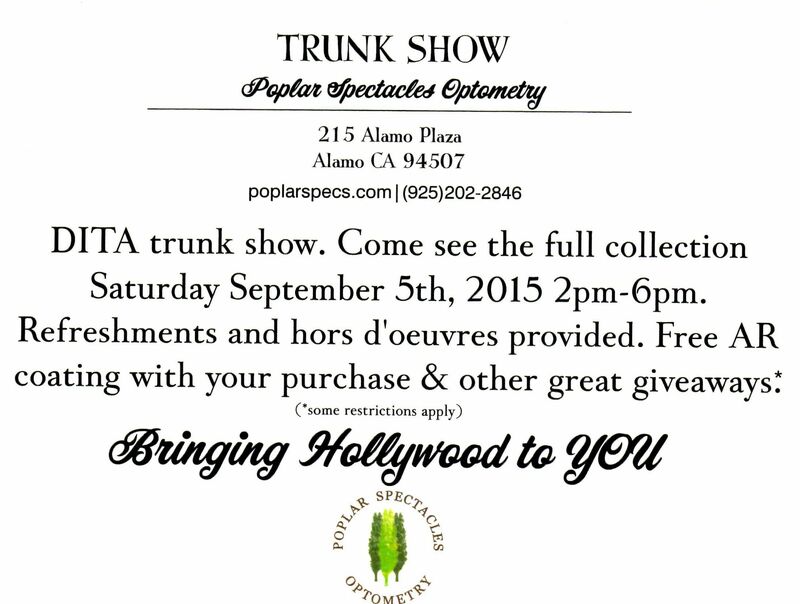 September the 5th we will be holding a trunk show! What is a trunk show you might ask? That's a great question! A trunk show is when the whole collection is brought out for the public to see. 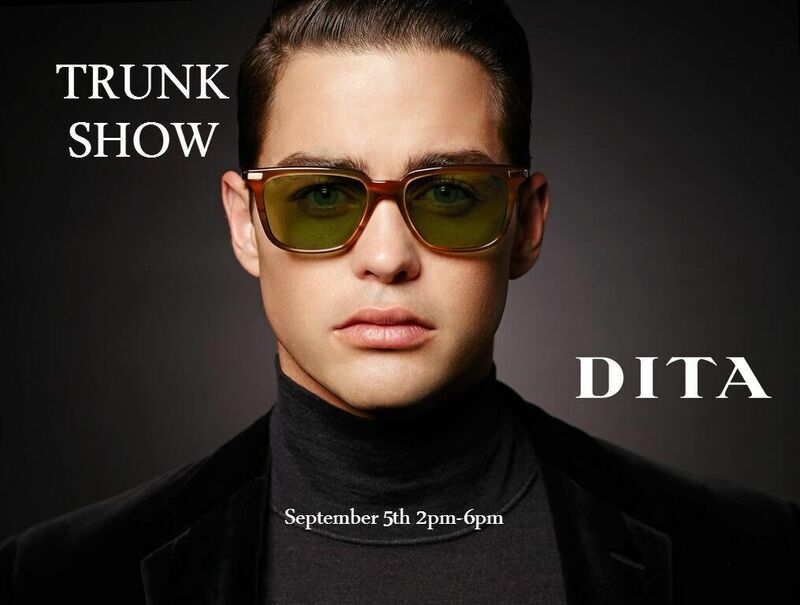 In our case, we will be having a DITA TRUNK SHOW, one of the brands we carry. Poplar Spectacles Optometry is teaming up with Andrea, the Dita Sales Representative, to bring you the ENTIRE COLLECTION of FRAMES & SUNGLASSES! The event will take place from 2pm-6pm, during which time you will be able to look at all the styles to find your perfect pair! Every Dita order that day receives FREE anti-reflective coating (AR) and there will be other great giveaways throughout the day as well. Remember to bring your current (within the past year) prescription so there's no delay in your order. Don't have a current prescription for your glasses anymore? Not a problem, the clinic will be open throughout the day too. Check out the details, RSVP and share the event with your friends here. Dont miss this special event, add it to your eventbrite calendar. We'd like to throw out a big "THANK YOU!" to the local businesses in the area that have very generously donated to help make this event even better!